Learn all about Furniture Mod Podge decoupage medium with this great how-to guide! Plus get your FAQs answered about this awesome formula. *Note – This formula has been discontinued. Use Hard Coat Mod Podge as a substitute. Having said that, I am leaving this article live on the blog since some people keep their formulas around for many years. I'm looking forward to discussing a most exciting topic with you today – Furniture Mod Podge! Why am I bringing this up now? Well, when I look at the “behind the scenes” of what readers are visiting here on the blog, I can see very clearly that you love re-doing furniture! Or at least admiring it. This category is popular and heavily searched, which doesn't surprise me because I too love making over furniture – large and small! So in addition to you guys wanting to see furniture projects, some questions popped up on the Furniture Mod Podge formula in my Facebook group. I knew it was time to add a post about one of the latest additions to the Mod Podge decoupage family – so here it is. You can use it to apply fabric or paper to these surfaces above, or most anything else you can think of that you might want to put on furniture. MP Furniture s a non-toxic, waterbase formula, just like the other Podges, which mean it's safe for anyone to use (including children) and you don't need gloves. Nice for a furniture finish, right? It's super tough. I don't really know what's in it, but maybe dragon skin? Or armadillo shell. Just kidding of course, but the whole point of the formula is to be tough and provide protection for your decoupage projects, and it definitely does that. Q: How is it different from Hard Coat? A: It isn't. But here's the thing – it comes in three different finishes, which Hard Coat doesn't . . . and it comes in larger bottles, because you're probably going to need a larger bottle for a lot of furniture pieces. Instead of buying two bottles of Hard Coat and spending more, you can get this. Q: Is Furniture Mod Podge waterproof? A: No. The only waterproof formula is Dishwasher Safe. Even the Mod Podge Outdoor is only highly water-resistant. But, you aren't soaking furniture pieces with water, so it's going to meet your needs. 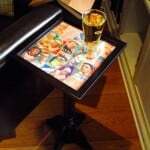 If water is spilled on a surface with this decoupage medium, you're going to be fine. Just wipe away the water as soon as possible. Q: How does it compare to epoxy? A: It's not like epoxy at all. The finish isn't hard and thick like epoxy, and Mod Podge is waterbased and non-toxic. Epoxy puts a glass-like coating over the top of items. Mod Podge is a completely different finish. It can be used as a decoupage medium while epoxy cannot – epoxy is simply a thick, hard top coat. Try them both out and you will know exactly what I'm talking about! 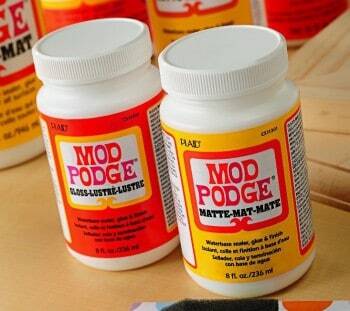 Q: How can I best apply Furniture Mod Podge? A: I use a larger applicator than a regular paint brush because typically the items that I'm decoupaging are larger. This means I use the 2.25″ brush for smaller furniture items and the 4″ brush for larger items like tables, bookshelves, etc. You can use any brush you want . . . these just happen to make your projects easier! Q: Can it be used with fabric? A: Absolutely. I recommend it for adhering fabric to a table. Or chair. Or whatever. Q: Can I use this formula in place of other Mod Podges so I don't have to buy something else? A: Sure! If anything, this formula is overkill for a regular project since it's so durable. Now, if you're trying to attach fabric to fabric or something, you'll still need to use Fabric Mod Podge (for example). I think that's it, and I hope you feel educated about Furniture Mod Podge and are interested in trying it – however, if you have questions, I'd love for you to leave them in the comments and I'll be happy to answer! 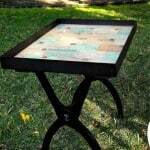 can you polyurethane over a furniture Mod Podge project? Absolutely! Minwax Polycrylic works great. If I am adhering to wood that already has a finish on it (e.g. varnish), do I need to sand it before applying the mod podge? And, I am assuming the steps are apply mod podge to surface, apply the medium (cardstock, fabric, etc) and then mod podge over ? thanks so much–never knew there was such a thing as mod podge for furniture. But on a larger scale! Good luck! 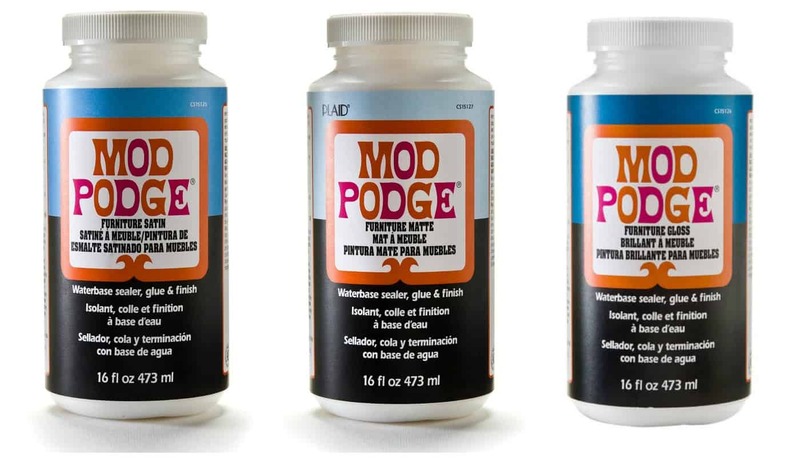 Can Mod Podge be applied over the laminate surface that covers much of IKEA furniture? Should it be sanded as well? I’m mod podging material on to old wood filing cabinet. I have Matt Mod Podge, what do you think should go over the material. Hi Joyce! I’d recommend Furniture Mod Podge, but if you can’t get your hands on it, spray an extra clear coat or something to make it really tough! Can you suggest me a project for Mother’s Day (for babies) please?